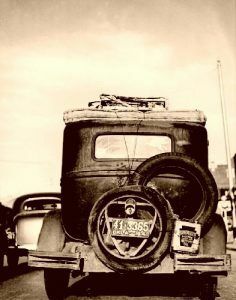 For many, Route 66 is in their blood – they grew up on the old highway, traveled the road with their parents when they were kids, or, perhaps, even pumped gas at one of the many vintage filling stations at a time when owners actually knew what the term “customer service” meant. For others, they are nostalgic like me – “old souls,” some might say. And, if it’s history, it’s interesting!!! What the Santa Fe Trail is to us today, Route 66 will be to our future generations, and its heritage and history can no more be forgotten than those of the wagon train pioneers. Yes, it was another era — one that made a giant step in the progress of a nation. So, people say to me all the time, “I just don’t get it.” Well, if you travel this vintage pavement, I can guarantee that you will. Along this historic path, that generally follows an even older one – that of the railroads as they expanded westward, there is history that dates back far beyond the asphalt of the Mother Road. It’s not just about an old highway – it is so much more – an evolution from historic trails such as the National Old Trails highway that traversed much of the same road in New Mexico, Arizona and California; the Trail of Tears that converges with Route 66 in Missouri and Oklahoma, and the Santa Fe Trail in New Mexico. Along this vintage road, you will not only find the “good ole’ days” that you may remember, but also a depth of history that perhaps you can only imagine. From Civil War sites in Missouri and Oklahoma to outlaws in Texas and New Mexico, to the numerous gold mining camps of Arizona, the sights along this old highway are incredible. If you long for the good ole’ days with the buttery smell of popcorn at the drive in theater or a greasy burger at the local diner, you will have plenty of opportunities at places like the Cozy Dog Drive-In in Springfield, Illinois; the Munger Moss Motel in Lebanon, Missouri; or the Snow Cap Drive-In in Seligman, Arizona. 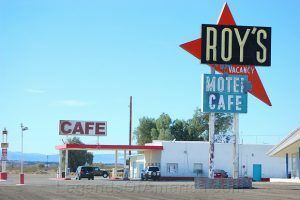 If your memory revives the days of Stuckey’s , Steak ‘N’ Shakes, and Burma-Shave signs, you’ll be happy to know that some of these Route 66 icons are on their way back! If it’s an older part of the west that you’re looking for, you’ll find that too. Holbrook, Arizona was once said to have been “too tough for women or churches;” Tucumcari was once referred to as “Six-Shooter Siding,” and Galena, Kansas was the site of much bloodshed during its coal mining days. Even though several interstates have virtually replaced the old highway, almost 85% of it can still be traveled. Along the way, you will encounter the remnants of ghost towns killed by the super highways that replaced Route 66. Some of these are a ghost towner’s dream, such as Glenrio, Texas; Cuervo, New Mexico; and a long stretch of ghost towns as you enter California’s Mojave Desert. Along this historic road, numerous lakes, state and national parks, and historical sites are abundant. Take your time, as, all along the old Mother Road, there is something for everyone. 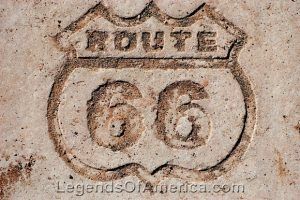 A Route 66 shield is carved in rock to commemorate where the Mother Road once ran through the the Petrified Forest National Park in Arizona. Photo by Dave Alexander. © Kathy Weiser/Legends of America, updated August, 2015.